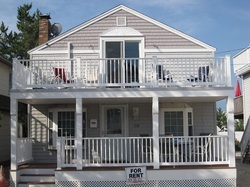 Other LBI Properties - 121 East 19TH St. Ship Bottom, NJSpacious Weekly Rental - Steps from the Beach, with Ocean Views! Spacious Weekly Rental - Steps from the Beach, with Ocean Views! Don't see a week open that works for you? Looking for a smaller rental? We own another rental property on 13th Street in Ship Bottom - A duplex with two units. (sleeps 4 - 6) Click here to view it.